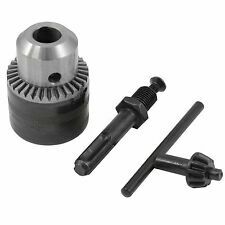 Hilka Pro-Craft SDS Chuck Adaptor Kit. Everything needed to use a Standard Keyed Chuck with an SDS Drill 1/2" x 20UNF Thread. Suitable for Cordless and AC Hammer Action Drills. 1.5-13mm Capacity. Supplied with Chuck, SDS Plus Adaptor and Chuck Key. Brand: Hilka. .
OFF-SET BAR ON LARGE KEY FOR LEVERAGE. 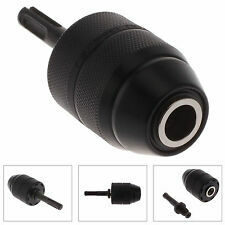 4 IN 1 UNIVERSAL DRILL POWER TOOL CHUCK KEY. FOR 1/4” 3/8” 1/2" 5/8” CHUCK SIZES. SIZES FROM: 6mm to 13mm. 4 WAY UNIVERSAL CHUCK KEY. SUITABLE FOR MOST DRILLS AND POWER TOOLS. 10mm (3/8" x 24 UNF) keyless Drill Chuck. 3/8" Unf female thread mount which fits all drills. Keyless chuck for fast bit change. Takes drill bits up to 10mm. Helping anyone out where we can. We also have a full range of spill protection products available such as full response kits to individual boxes of oil/chemical spill pads and absorbent booms (sausages). Quality 13mm 1/2" x 20 UNF Keyless Chuck Bosch / Makita Drills Ect. 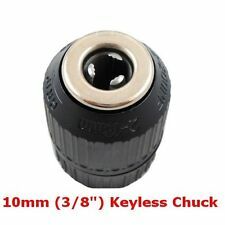 13MM 1/2" X 20 UNF Keyless Chuck/span>. 1/2"x20 UNF Mount. Keyless chuck for use on Rotary and Impact power drills, cordless drills and drill drivers. This is a keyless chuck for a 13mm (1/2") Drills. 4 out of 5 stars - Quality 13mm 1/2" x 20 UNF Keyless Chuck Bosch / Makita Drills Ect. 14 product ratings14 product ratings - Quality 13mm 1/2" x 20 UNF Keyless Chuck Bosch / Makita Drills Ect. 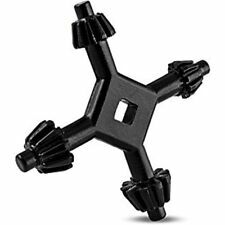 1x Hex Shank Adapter. Chuck range: Approx. 0.8-10mm/0.031"x0.39". Jacobs K3B chuck key Product information Original Jacobs key to suit industrial chuck requiring K3 or K3B keys such as Jacobs 3, 3A, 3AE, 3B, 3KD, 3PD, 6AE, 6A-2A, 6A-33, 6B, 14N, 34, 34B, 34KD, 34PD, 35, 55B, 56B, 58B, 75A, 634, 634B44Z-6B, 43SB-6A The pilot pin size of this key is 5/16 It can also can be used as a direct replacement for Rohm S10 chuck keys. Driver Shank: 1/4" (6.35mm) Hex Shank. - Use This Chuck to Convert Any cordless Screwdriver into a drill or grinder. 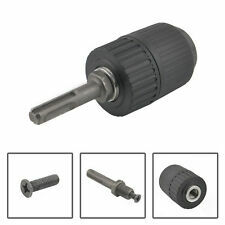 1pc x Keyless Drill Chuck. - Allows hex drive power tools to use conventional drill bits. Black finish replacement keys for 10mm (3/8") and 13mm (1/2") Chucks 2 Keys in one pack. 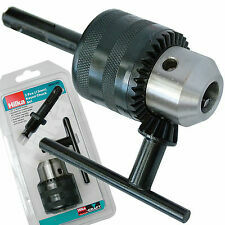 Brand: Hilka. .
You are purchasing a Dewalt DT7005 SDS adaptor 1/2" 13mm Key chuck fits all SDS drills. SDS adaptor with 1/4 hex insert for screwdriver bits. 1/2" 13mm 20 UNF threaded chuck with key. HBM 13MM CAPACITY KEYLESS DRILL. WITH SDS ADAPTOR. TWIST LOCK ACTION. High Quality 13mm Chuck Key. Suitable for 13mm chucks. Compatible with all 13mm Chucks. If you recently placed an order and you're wondering why you haven't received it yet then you are at the right place, this page is designed to help you get your order as soon as possible. All Steel Keyless Metal Chuck, 13mm Metal keyless chuck that fits all cordless and corded drills with a 1/2 inch x 20. All Steel. 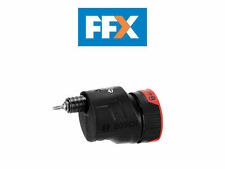 Features: ---Keyless chuck for use on mains powered, cordless drills and drill drivers. 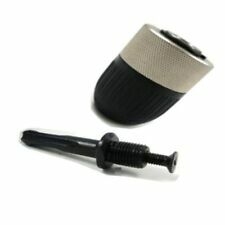 ---Quick and easy to use by hand for fast bit changes ---Heavy duty steel body ---2-13MM Capacity ---1/2". WITH SDS ADAPTOR. HBM 13MM CAPACITY KEYLESS DRILL. TWIST LOCK ACTION. Includes SDS adaptor. 1 x SDS chuck adapter. Takes drill bits up to 13mm. Keyless chuck for use on mains powered, cordless drills and drill drivers. Keyless chuck finger-tightens for easy bit changes. 13mm keyless chuck plus sds adaptor fits any drill makita dewalt bosch 1/2"
SDS Adaptor with 1/2" keyless Chuck. Takes drill bits from 2mm to 13mm. Keyless chuck for fast bit change. Helping anyone out where we can. We also have a full range of spill protection products available such as full response kits to individual boxes of oil/chemical spill pads and absorbent booms (sausages). 4.5 out of 5 stars - 13mm keyless chuck plus sds adaptor fits any drill makita dewalt bosch 1/2"
16 product ratings16 product ratings - 13mm keyless chuck plus sds adaptor fits any drill makita dewalt bosch 1/2"
CHUCK KEY 4 WAY UNIVERSAL FITS MOST ELECTRIC DRILLS. A 4 WAY UNIVERSAL CHUCK KEY. 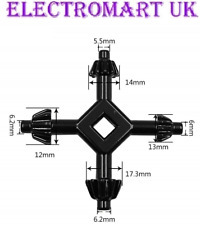 Specification: Material: aluminium alloy Clamping range: 0.3-3.6mm Inner Diameter: 8.0mm Color: Black Fits for 1/4-inch hex shank electric tools Features: Universal chuck Quick Change Keyless Chuck Chuck allows quick and easy accessory changes without changing collets Easy to use and install. Conveniently, safely; quickly. 1/2 unf 20tpi female thread. Keyless for quick change. I have for sale a drill chuck. Mitre, Site & Table saws. No listed products found. Marking Out. Dust Extraction & Vacuums. Availability:Usually dispatched within 24 hours Buy it now. Impact Drivers & Wrenches. BLACK&DECKER. Masks & Filters. 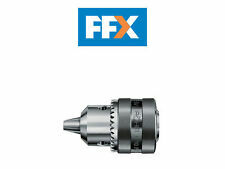 Festa 13 mm 1/2" x 20 UNF Keyless Drill Chuck. 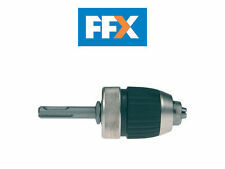 Festa Keyless Drill Chuck 13 mm. 13 mm Chuck capacity of 1.5 mm - 13 mm. Universal fit. Will fit 13 mm Drills. MADE IN CZECH REPUBLIC. Keyless chuck finger-tightens for easy bit changes. 1x Keyless chuck. Instantly convert impact driver to hold non-quick change drill & driver bits. Quickly convert your quick change hex shank driver into a drill! KEYLESS CHUCK WITH 1/4" 13MM SDS ADAPTOR. Enables SDS plus drills to be used for conventional drilling. And 1/2" (13mm) chucks. 2 pce Chuck Key Set. Quickly convert your quick change hex shank driver into a drill! 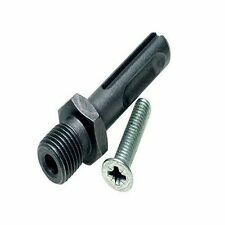 Connecting link: 1/4”(6.3mm) Hex Shank. Keyless chuck finger-tightens for easy bit changes. Instantly convert impact driver to hold non-quick change drill & driver bits. 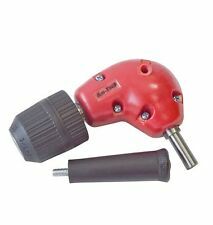 This adaptor enables the use of a normal standard key or keyless chuck to be used with a SDS drill. -SDS plus shank with male thread. -Suitable for Chucks with a 1/2" x 20 UNF Thread. 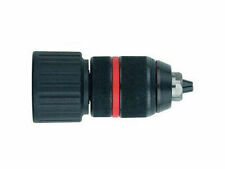 -Suitable for all 1/2" / 13mm chucks Key or Keyless drill chucks. Mount: 1/2-20UNF. 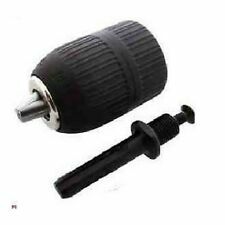 2-13mm Self Locking Keyless Drill Chuck with 1/2 SDS Adaptor. the locking peripheral length, more effective in preventing work loose off, so that the clamp chuck more reliably support tools.